So, this post succeeds our explanation on WordPress custom Nav menus. We’ve seen previously how we can use wp_nav_menu function to show user defined menus in the theme. But what if the user doesn’t provide any menu to the theme location? WordPress will then use the fallback function to write a default menu. wp_page_menu is used by default which just prints all the pages of your blog. In many situations, especially while developing themes, you might not want this to happen. You might want to give the user more refined way to control the output of the default navigation menu. You might want to display specific pages along with specific categories. You might also want to include the Home button and our famous dynamic login/logout button to the navigation. In such cases, you will need to write your own fallback function from scratch. Today we shall see, the right way of writing the fallback with various customization option. We shall also add Home button to it, give it proper class, list the pages we want (hierarchically) along with hierarchical categories. What next? Yes, you have guessed it right. 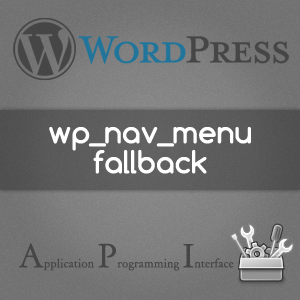 We will be writing our primary_menu_fallback function which we have passed to the wp_nav_menu as an argument. Add Home button with custom class (current on home page) for styling. Add the pages we want in specific number of tiers. Add the categories we want in specific number of tiers. Add our dynamic login/logout button. So now the wp_nav_menu will first try to output user’s own menu if provided, else will fallback to your own function. This is the most sophisticated way of handling the fallback. In our next chapter, we shall see how we can directly hook into wp_nav_menu to even customize the user’s own menu dynamically. Till then, have fun with the fallback. Be creative and show us what fallback are you falling for?